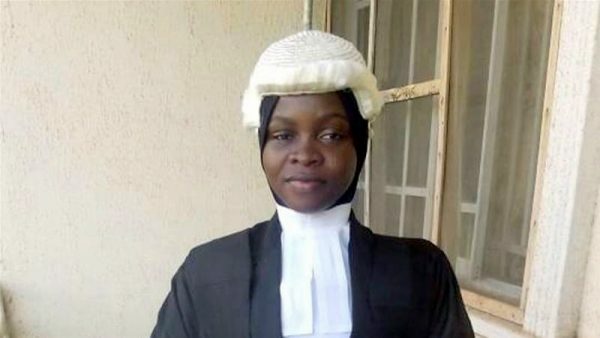 The Muslim Rights Concern (MURIC) have in a statement called on the government to resolve the issue involving Amasa Firdaus, a law student who was barred from writing her call-to-bar exam because she refused to remove her Hijab. In a statement signed by the President of the body Professor Ishaq Akintola, he decried the inaction of the Senate in investigating the matter and asked why there was suddenly foot-dragging involved in the matter. The statement reads; Amasa Firdaus was barred from call to bar ceremony of the School of Law on Wednesday, 13th December, 2017 because she refused to remove her hijab. The Tsunami of condemnations which followed this unjust treatment forced the House of Representatives to assign its Committee on Judiciary and Justice to investigate the matter. However, a public hearing slated by the latter for Tuesday 6th February was suddenly postponed after a coalition of legal practitioners sought the courts intervention in stopping the public hearing. Justice Anwuli Chikere of the Federal High Court, Abuja, on 28th February restrained the House of representatives from holding the public hearing. Nothing has been heard since. The Muslim Rights Concern (MURIC) is horrified by the deafening silence coming from the House of representatives particularly after the court granted the injunction seeking to stop the public hearing. We are palpably appalled by the seeming lack of a political will on the part of the representatives of the people to pursue the course of justice. The court merely stopped the public hearing. It did not stop the House from continuing other investigations. It did not stop the House from taking a position. So what is the House afraid of? What are the people’s representatives waiting for? It is interesting to note that the House Committee on Judiciary and Justice had called for and received a large number of memoranda on the matter prior to the date fixed for public hearing. MURIC was one of several Islamic organizations which submitted memoranda to the committee. We submitted one by courier from Lagos and traveled to Abuja to submit another. The question is, “What has happened to all the memoranda?” It is our considered opinion that the huge volume of memoranda received by the House is enough to guide it in taking a decision on this crucial matter. Justice delayed is justice denied. We are flabbergasted by the inaction of the House and its inexplicable procrastination. We are shocked to our marrows that a House which parades renowned activists cannot see the need to rise in defence of a poor, innocent and vulnerable feminine creature of the Adamic chromosome. We are disappointed that even the female members of the House cannot stand up to be counted in the struggle to get justice for Amasa Firdaus, the young, bold and vibrant Amazon of our time. Amasa Firdaus must get justice. She has challenged an unjust status quo at a time many of us are succumbing to tyranny, oppression and persecution. The fact that a young lady has cried out in the midst of excruciating silence and in the face of repression should arouse the curiousity of women in the Green Chamber. The courage manifested by Firdaus should jog the chivalry in the veins of valiant men in the House. Yet here again lies the anatomy of religious crisis, particularly those accompanied by violence and terrorism. Frustration often leads people to react when those in authority fail to address acts of injustice. We affirm clearly, categorically and unequivocally that justice is the soul of peace. There is a symbiotic connection between justice and peace to the extent that any society that fails to give justice will never have peace. No matter how hard they may try, deniers of one will never have the other. Allah-given fundamental right of a Muslim lady was violated four months ago and our lawmakers are foot-dragging. Amasa’s mates who were called to bar on that fateful day are now working and earning a living in some law firms in the country. The hope of Amasa’s old parents that their daughter would soon start taking care of them is dashed. They had laboured in loco parentis under a hard economic situation to sponsor her through an expensive university education. Who did this to Nigeria? If we are sincere about the pledge in our national anthem that “the labour of our heroes past shall never be in vain”, why are we wasting the labour of our young ones, the leaders of tomorrow? Can’t we realize that Amasa Firdaus is a product of the labour of our heroes past? We claim to be encouraging female education but here we are frustrating the attainment of the educational goal of a female who has satisfied all righteousness. MURIC demands action. We are counting the days. It is not in our character to issue threats. Neither do we subscribe to issuing ultimatum. But let nobody blame Muslims when they start peaceful demonstrations in the coming weeks. Let no one accuse Muslims of coming out on the streets. We will defend our sister if the authorities fail to act. We will use every legitimate means possible to get justice for Amasa Firdaus, the Muslim Amazon of our time. In our concluding remarks, we contend that if according to Martin Luther, injustice anywhere is a threat to justice everywhere, then injustice to Amasa Firdaus is a threat to justice all over the world. We, therefore, charge all lovers of freedom of expression, all champions of liberty, all promoters of women education and all those who oppose discrimination against women in all parts of the globe to identify with the case of Amasa Firdaus. We call on people of good conscience in Nigeria, Britain, America, France and elsewhere to prepare for non-violent agitations and peaceful demonstrations in the coming days. State Houses of Assembly in Nigeria are advised to expect petitions and peaceful protesters. Muslim women, particularly in Nigeria, are reminded of the role which history has placed on their shoulders on this matter. Posterity will not forgive those who abdicate their responsibilities whether as lawmakers, non-governmental organizations or women groups. We should not rest until #JusticeforFirdaus becomes a fait accompli. Nonetheless, MURIC issues a caveat emptor: no participant in this legitimate struggle must resort to violence of any type. True to our avowed motto, ‘Dialogue, Not Violence’, we are peace-loving, law-abiding and dialogue-prone. We detest violence and condemn terrorism. We are middle-roaders and socio-intellectual jihadists seeking freedom for the oppressed, food for the hungry, healing for the sick, clothing apparels for the naked and shelter for the homeless.